Joe Raedle/Getty ImagesWorkers are seen as new construction takes place at the Umbria a Lennar Corp. project on September 19, 2011 in Miami, Florida. The US housing market is getting squeezed, and relief doesn’t seem to be coming any time soon. Stuart Miller, CEO of Lennar Homes, laid out the full picture of the US housing market in a post-earnings conference call Tuesday, and explained why the hopes for a sudden pick-up in the American homeownership may not be on its way any time soon. In what may be one of the more frank discussions of the housing market we’ve seen from a homebuilder, Miller first acknowledges the ‘new housing crisis’ rising up in the supply of homes. “As we’ve noted consistently over the past years, the overall housing market has been generally defined by a rather large production deficit that has continued to grow over the past year,” Miller said on the call. This low supply of homes and higher demand then forces prices higher and higher, keeping first-time buyers out of the market and contributing to the higher rates of renting and apartment-dwelling. Miller does note that it is hard to judge the housing market as a monolith, for instance the San Francisco market is different from the market in Charlotte, NC, which is different from the market in Stapleton, Nebraska. Now there is an obvious question to ask: If there is so much pent up demand, why don’t builders like Miller’s Lennar increase their pace of building to keep up with the demand? In theory, this would make more money for Lennar and alleviate some of the issues facing the market. The homebuilders, however, face their own set of issues that prevent them from accelerating building. 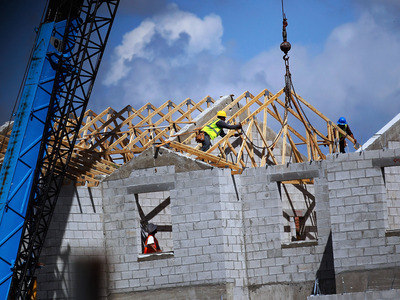 “Nevertheless, land and labour shortages will continue to be limiting factors and will constrain supply and restrict the ability to quickly respond to growing demand while the mortgage market and higher rents will continue to constrain that demand,” said Miller. Additionally, the lack of supply is driving up completed home prices. Toll Brothers, the largest luxury homebuilder in the US, reported a huge increase in the sale price of their homes during their second quarter. This partially incentivizes homebuilders to keep supply tight to continue to drive this pricing power. Miller’s use of the term “new normal” also calls to mind the recent economic theory that the world is stuck in a low productivity, low growth economic environment. The way that Miller concluded his assessment of the housing market does little to refute the comparison. “We expect that these conditions will continue to result in a slow and steady positive homebuilding market and will enable slow, steady though sometimes erratic growth throughout the industry,” said Miller.